Pommies Curried Pork Stew » Pommies Cider Co.
Pommies goes well with everything! But if we had to choose two foods that were meant to be paired with cider, they would be curries and pork. 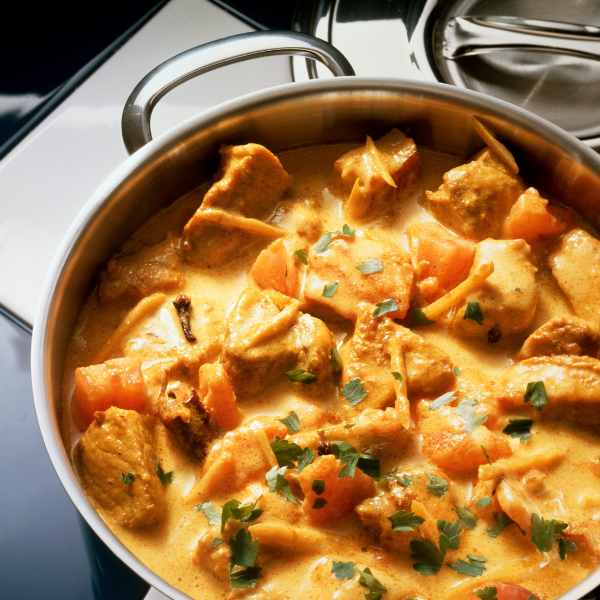 This curry stew recipe combines for a delicious and hearty meal. Trim fat from pork and cut pork in 1-inch cubes. Peel, core, and chop two apples; set aside. Brown the pork in a pot, half at a time, in hot oil; return all pork to pan. Add chopped apples, onion, and curry powder; cook and stir 2 minutes. Add broth, Pommies, salt, and pepper. Bring to boil; reduce heat. Simmer, covered, 30 minutes, stirring occasionally. Add carrots and celery to pork mixture; return to boil. Reduce heat; simmer, covered, 20 minutes, stirring occasionally. Cut remaining apples into 1/4-inch-thick wedges. Add apples and butternut squash to pan. Cover; cook 10 to 12 minutes or until pork and vegetables are tender.